Carrie and I spent a week living at the Arba Mistika guesthouse in Hampi, India, next to a giant teepee that some travelers slept in. Essentially two towns in one, the Hampi Bazaar area is a bustling tourist area with temples, countless overpriced hotels and shops and the feel of a large city. Most visitors stay here and are in and out in a day. The more adventurous, and those with more time, take a three minute boat ride across the river to Hampi Island, which is a tranquil and laid back sub-community with only one dirt street. The island is filled with rice patties, rivers, lakes, hiking, restaurants, guesthouses, Internet cafes, little shops selling only essentials and tons of hippies…mostly Israeli. No one is in a rush, everyone gets along and the entire island has a great vibe. Music, jam sessions and drum circles are also an integral part of the hippie culture. Most restaurants have some sort of instruments laying around that are often picked up and played by random patrons. Some times this leads to a collection of people playing, sometimes not. Once in a while a place will plan and advertise a formal jam session, but for the most part they are spontaneous and break out at random times. 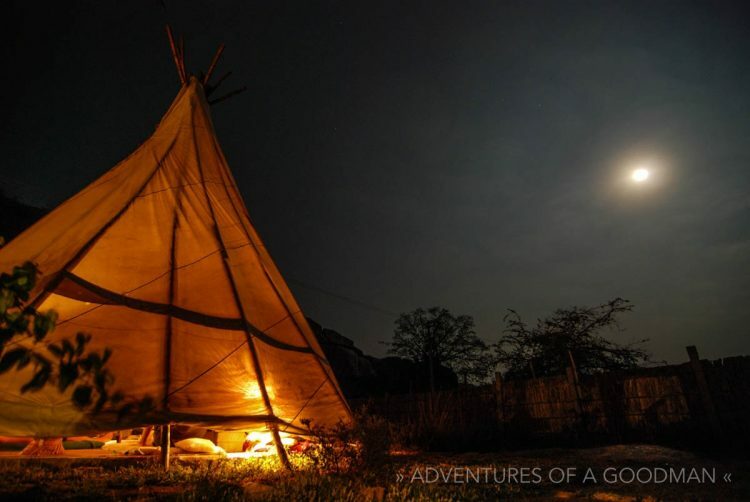 One night, during a full moon, about 30 hippies convened on the tepee outside our room and we were treated to a massive drum circle complete with flutes, digaridoos and guitars that lasted well into the am hours. Finally, a video of the drum circle outside the Arba Mistika guesthouse in Hampi, India. Yup. It’s a Tree. In India.